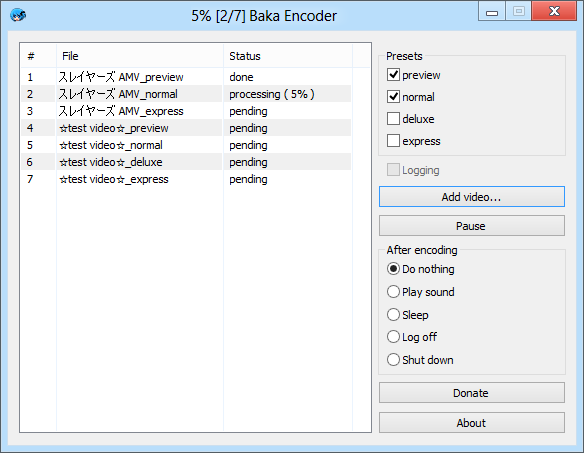 Baka Encoder – software with graphic user interface (GUI) for encoding videofiles with codecs x265 (also x264 is possible) and NeroAAC. Handles AviSynth scripts, video/audio without compression and video compressed with common intermediate codecs. Presets are defined via XML config with direct control over x265 (also x264 is possible) and NeroAAC command line parameters. This tool was developed mostly as a replacement for MeGUI to be less cluttered, more flexible and providing better quality. Handles: Uncompressed PCM audio, Uncompressed RGBA, RGB, RGB48, YUY2, YV12, HuffYUV, Lagarith (without null frames), UT Video, MJPG, Avisynth scripts. To add/change encoding presets edit Baka Encoder.config.xml file in notepad. Avisynth required only if you want to process AVS-scripts. Log files have the same name as output files with “.log.txt” appended. 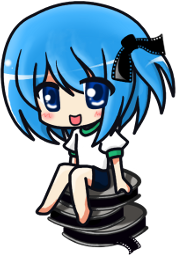 In order to load particular presets XML-file drop it onto Baka Encoder.exe. Baka Encoder is a portable self-contained tool so it makes sense to squeeze all the codecs and CLI stuff into a single executable. And it is being updated on the monthly basis which is quite frequent if you ask me. But your point is reasonable as some enthusiasts might want to use the latest x265 build available. So support for using CLI tools located in the same folder with Baka Encoder.exe instead of build-in ones will be added in the next version. Which is to come out on this weekend. I understand, thanks for reply. I’ve tried muxing encoded video with mkvMerge v7.8.0 and it turns out that mkvMerge is indeed unable to mux it properly just from any source except for raw hevc stream. But I’ve managed to find a fancy workaround: mux .mp4 into mkv (it will lack keyframes), then extract raw streams from this mkv using mkvExtract, then mux extracted streams into another mkv (it will have proper keyframes somehow). Note that remuxing from mkv to another mkv directly will produce the same file with missing keyframes. So i guess it’s an mkvMerge issue. I was already considering adding an option to output mkv, however the demand for this seems to be low as ppl tent to perform additional tasks for mkv besides muxing (adding chapters, subs, etc..). However adding an option to output raw encoded streams should be fairly easy. how to set x265 lossless RGB compression or 10-bit YCgCo from RGB .avs? into video cmd line at lossless preset in default Baka Encoder configuration file. Automatic localization does not work. I cannot read the interface. How to force it to my language? Which language is used by your system and which one is being used in Baka Encoder? How do i change it to English language please ? Which version of Baka Encoder are you using? An issue with wrong translation being picked sometimes was fixed in 1.4.7 and I’m not able to reproduce this with the latest version. When system language is set to French Baka Encoder displays English translation. Same thing using the x86 one or the mixed x86-x64 exe. I don’t have any other languages pack on my system OS i can’t test it in English or anything else sadly. Let me know if you need more infos to figure this out. The thing is Baka Encoder does not manage language preferences, instead it lets Windows Resource manager pick the most appropriate variant from embedded resources. So if you are getting hieroglyphs then it means that either Baka Encoder resources are incorrect or Resource manager is messed up. This util shows a list of preferred languages used by Windows Resource manager. And I was getting updated version ready anyway, so you can try it and check whether this problem is still present. Hello and sorry for the late reply on this. The 1.50 baka exe gives me the same results as before with Japanese mixed languages.too, no luck with this one. Thanks a lot for your time and dedicated work trying to fix this. I guess I hit nested comments depth limit, so I reply here. Typically preferred UI languages list contains English at the end. But it your case it doesn’t. So Windows seem to grab first resource, which is Chinese (code 4, while English is 9). PS you can actually e-mail me directly using address specified in Baka Encoder About window. I think I never had English language in this OS, i mean only possibility is French, i can switch keyboard to English but that’s all, i can’t switch the OS to any other language. It’s a legit win7 Pro x64, probably a OEM version if i recall correctly, the first .iso name was Win7prox64__X15-65811.iso which is only in French language ( followed later by the Win7_SP1_FR_x64_X17-59197.iso for the SP1 pack ) , x15-65813 is German version and x15-65813 is Spanish for example. I will wait you next reply then i’ll start to answer you by mail yes, will ease a bit the comments section. Thank a lot for spending you time on this, really appreciate it. Please let me know whether it works. Thanks a lot for investing so much time in this issue. I will take a look this week end when I’ll have more free time for the translation and see what i can do, i mostly use my tools in English and sometimes translating such technical stuff to French is not that easy, i mean there is a lot of words meaning the same stuff here, but i will give it a try and do my best, will be something to start with at least, and with the all efforts you put in trying to fix my issue it’s the minimum i can do to help back a bit. Thanks a lot for the help and the work you put in this, really appreciate it. подскажите что делать? при запуске кодирования, появляется ошибка. Для начала следует написать, какая ошибка, какая версия Baka Encoder, какая система. Если в столбце Статус стоит “ошибка”, то при наведении на название задания будет показана всплывающая подсказка с подробностями. А вообще было бы неплохо включить лог и прислать его. 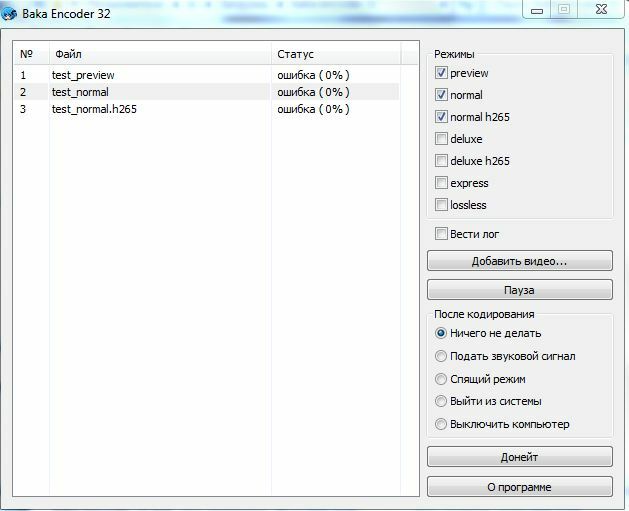 А можно в студию подробную инструкцию использования Baka Encoder? – и иллюстраций с примерами по больше. Отмечаешь нужные пресеты, жмешь на кнопку “Добавить файл”, выбираешь нужные файлы в стандартном диалоге выбора файлов, идешь гулять пока все задания закодируются. Программа отказывается воспринимать любой формат. Выложите плиз не большой отрезок видео для теста. Все заявленные форматы обрабатываются, если находятся в .avi контейнере. Поддержки разных дамповых контейнеров типа .y4m или .yuv нет. Собственно и потребности в их поддержке как-то не было. уже писал в другой теме: ошибка при открытии .avi. Энкодер берет на вход файлы в формате YUV или Y4M. подскажите, пожалуйста, как скормить программке видео из ремуксов, к примеру такое https://pastebin.com/UC0fryCp ?